At My First Skool, we do not just focus on what our children learn. We want them to love the learning process. This is why we are always making learning more effective and interesting for them -- be it through curriculum development, partnerships with leading agencies, or through teaching innovation. Together with our partners, our children are exposed to STEM at an early age through their curriculum to develop critical thinking and reasoning skills. Learning stations within the pre-school are dedicated to STEM and are equipped with technology-enabled toys to foster creativity and problem-solving skills. The Technology Lighthouse at My First Skool introduces user-friendly, intuitive Apple technologies in centres that complement classroom activities and enhance engagement with young learners. In helping children grasp the concept of programming as a series of commands, the apps Lightbot, Ozobot and Code Warriors are used and teachers are able to make use of the iPad and Apple TV to do a demonstration of the app for children. Through this process, the children are able to gain a rudimentary understanding of programming and what coding is like. Our teachers are also equipped with skills to design exciting STEM-based education programmes. The partnership also engages parents to ensure a continuum of children’s learning from school to home. Parents are invited to join their children at STEM learning stations and attend relevant workshops with their children. To advocate the impact and value of an arts education at pre-school level, My First Skool has partnered with National Arts Council to nurture creativity in children from young. The programme offers children varied opportunities for learning through the arts, with arts content and lesson plans co-developed by teaching artists and pre-school teachers. The pre-schools feature workshops spaces, courtyards and galleries to showcase children’s artworks, creating inspiring environments for free thinking and creativity. This programme also reaches out to engage parents in their children’s learning journey. Through workshops for both parents and children, children benefit from a continuum of learning from school to home as parents get to learn art activities they can do at home with their children. 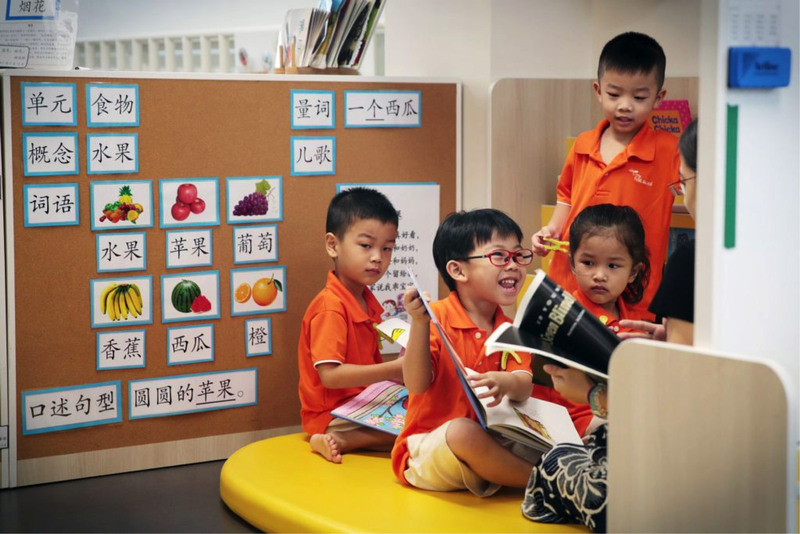 Joining hands with the Childhood Bilingualism Research Centre (CBRC), Chinese University Hong Kong and NTU’s Early Cognition Lab, we look into how children develop bilingual competence in early childhood, and form racial identities and biases. The learning environments and classrooms are designed to support each type of instructional language activity that will take place. Once children learn which activities typically take place in various parts of the classroom, the physical environment will provide cues to them in terms of what they should do and how they should behave (including language use) in that space. Classroom routines provide scaffolding for bilingual/multiple language learners by allowing them to anticipate what will happen each day, including the type of language they need for each activity. 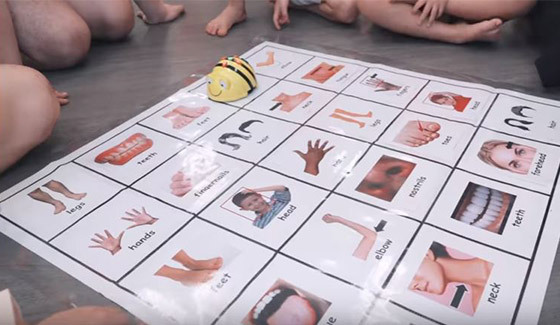 Our children will get to play games that require them to switch between English and Chinese, and are taught basic greetings in the four official languages. They also get to engage with other cultures through puppet theatres, technological tools and current affairs. Children learn values such as care, honesty, good judgement, responsibility and respect for others who come from different cultural and racial backgrounds through role-play and fun rhymes. Using pictorial scenarios as a teaching aid, children are engaged in discussions about behaviours and actions, and share what they understand to be morally right or wrong. Trained teachers help them stretch their minds by demonstrating, encouraging and asking guided questions. Daily activities such as independent attendance marking, queuing up to wash hands and being tasked to look after little bonsais help to reinforce aspects of character development like responsibility. It is through hands-on experiences that concepts get internalised and as children play and interact with their environment, they construct an understanding of how the world works. As parental involvement is key to sustaining positive character and social-emotional development in their children, the programme engages parents in shared (parent-child) activities which can be done at home, as well as provide useful tips for self-evaluation and assessment of their children’s progress. Through a partnership with the Nature Society of Singapore (NSS), the centre’s children will be able to learn and appreciate nature through customised programmes that take learning beyond textbooks, and will see nature come to life with the park as their classroom. The ‘Every Singaporean a Naturalist’ (ESN) programme will equip children and teachers with the knowledge of local plants and animals through NSS’ professional development training, enabling them to develop an awareness and deeper appreciation of nature. This is the first such educational initiative by a pre-school operator in Singapore with NSS. Zhenghua Nature Park and the surrounding Nature Reserve area are home to some 37 species of birds that live and regularly pass through it. Through the ESN programme, teachers and children will be monitoring a number of these birds and gradually learn more about the vast biodiversity of wildlife in the park. As part of this initiative, we have developed a specially customised learning kit together with NSS to introduce young children to the monitoring of wildlife around them. This toolkit is also accessible to members of the public that wish to learn more about the natural environment around My First Skool at 6 Segar Road centre. 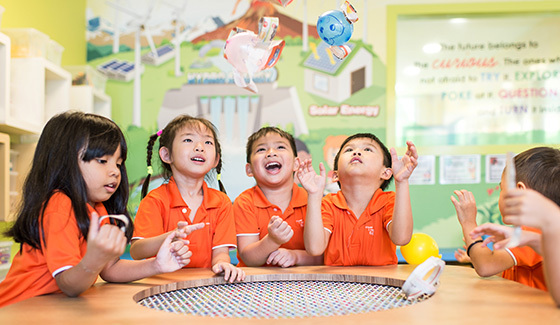 Young children attending MFS pre-schools located at all the various locations, be it at HDB void decks, shopping malls, or are standalone, will have more opportunities to interact with and appreciate nature. Currently, more than 30 MFS pre-school centres have developed Community in Bloom (CIB) programmes with input from the National Parks Board (NParks) and MFS plans to set up a CIB garden at all of its pre-school centres.